Tyler Florence’s recipes were very masculine, low carb, protein-heavy but with light, playful surprises (swoon). 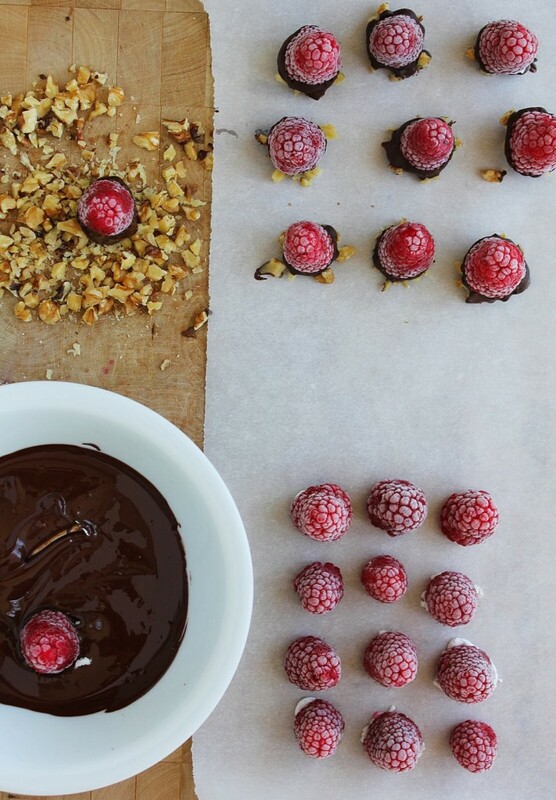 His ‘Frozen Raspberry Chocolate Bombs’ are the inspiration for this recipe. I was impressed by the simplicity of them when I did them in class, while it seems kind of fancy and fussy, it is a true minimal dessert skills required dessert. It is the kind of snack you would discover while working the pastry station on an empty stomach. 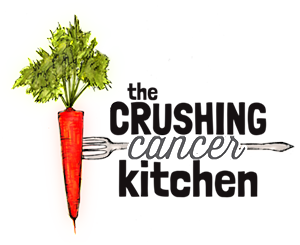 His were a little sassier, so I cleaned them up a bit and made them whole-food based, keeping the essence but inviting it into the world of cancer-crushing foods. I like the fact that with a few adjustments, this recipe is cleaner and healthier than many breakfast smoothies. These may seem a little high-maintenance, but it’s actually a quick process once you get going, and they are more than worth it when you taste them (and realize that you are setting yourself up for around 30 days of awesome once you freeze them) (as long as you don’t share). Did you know that if you put a can of coconut milk in your fridge for a few hours, open it and scoop out the solid part (freezing the watery part to add to a curry another day), and whip it up in a stand/hand mixer you get dairy-fee whip cream? It’s true. It doesn’t get as fluffy as real whip cream, but it’s a pretty awesome replacement when you’re having an all I want to do is roll in whip cream kind of day. Choose a BPA-free brand and shake the can in the store before you buy it to make sure it doesn’t swoosh like water (you want it to be separated into solid fat and liquid, not entirely fluid). You can easily dollop this new-style whip onto some local, organic raspberries and call it a day, but you will be missing out! The addition of vanilla bean powder and some soaked dates turn this into coconut ‘chantilly’, which is already way more fun than plain old whip. Once the chantilly is piped into the raspberry, this becomes very dessert-like, just remember not to feel guilty, it’s all good stuff. I do dip these in chocolate, but it is raw, dark chocolate, sweetened (minimally) with coconut sugar (the chocolate brand I use is called ZIMT -I’m not affiliated, just a fangirl- and is made locally in Vancouver, but feel free to use any artisanal raw, dark chocolate closer to you, just make sure the ingredients don’t get weird). You can also make these without the chocolate if you prefer, they will still be really good. The walnuts (plant source omega 3s!) stick to the chocolate, but so would many things. 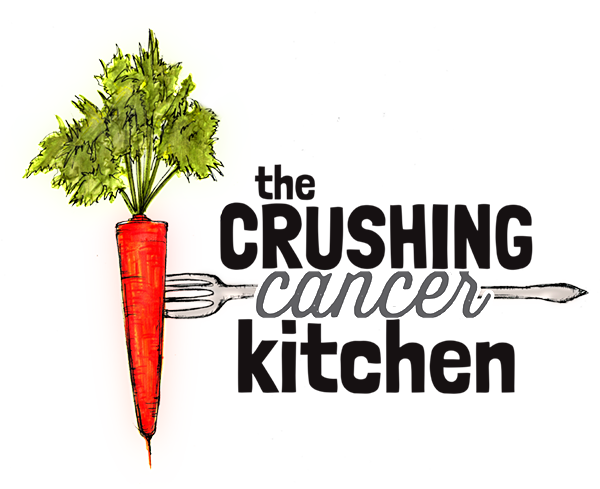 Are you looking for some extra immune-boosting zinc? Try chopped pumpkin seeds. More protein? Try hemp hearts. 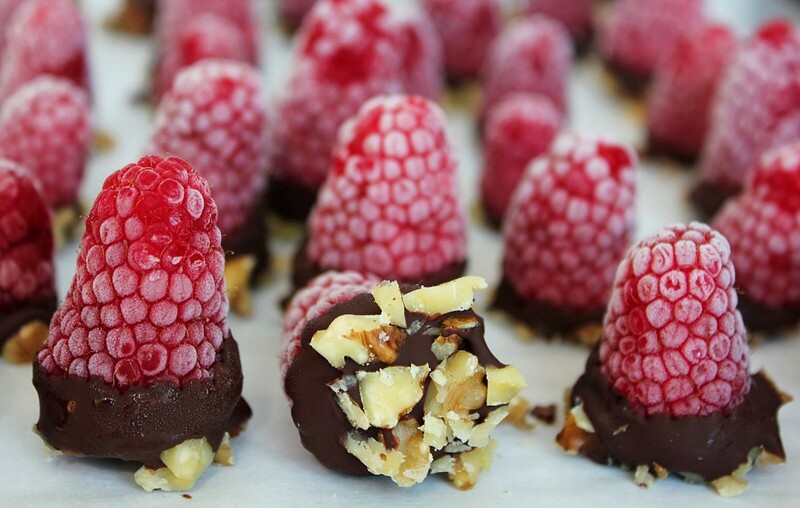 A little more chocolate kick (and the antioxidants that come along with it)? Use cacao nibs. These are the perfect make-ahead treat to serve when you’re having friends over who are expecting something boring and healthy for dessert (or nothing at all because you’re not supposed to be eating dessert, right?). Healthy, yes, boring, never! 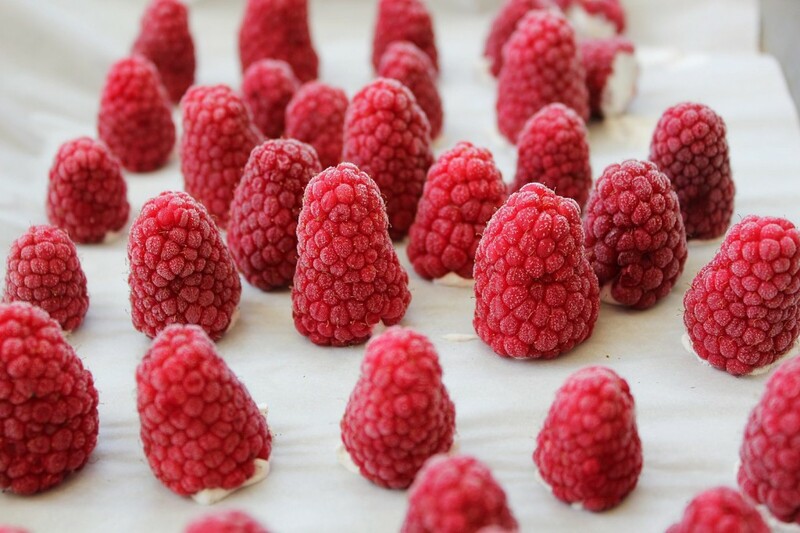 These little bombs would be incredible served with some 2nd ferment raspberry kombucha in champagne glasses for a mini, raspberry-tinted celebration. 2 Medjool Dates, pitted and diced or chopped up very small, covered in a small amount of warm water for 10 minutes. 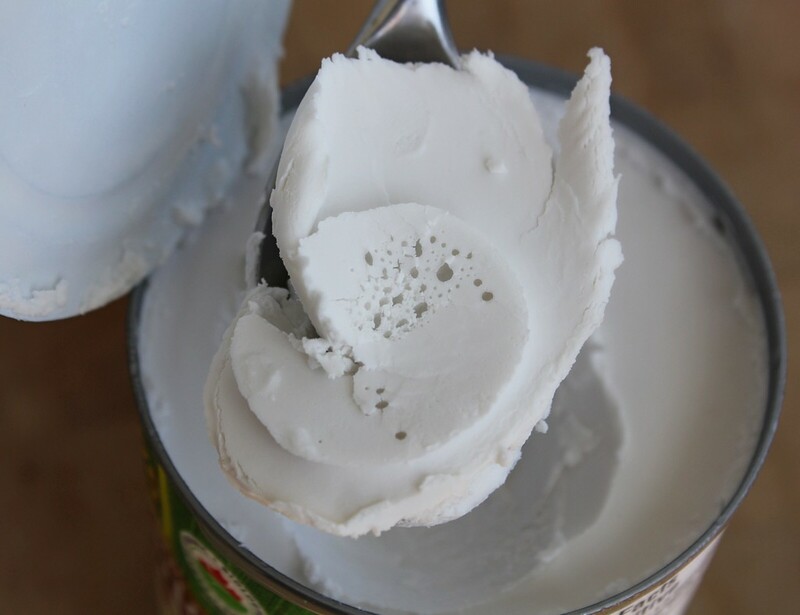 Refrigerate a (BPA-free) can of full-fat coconut milk overnight. Open it right-side-up, and scoop the solid fat part out, into a bowl (freeze the liquid part for use later in a curry). 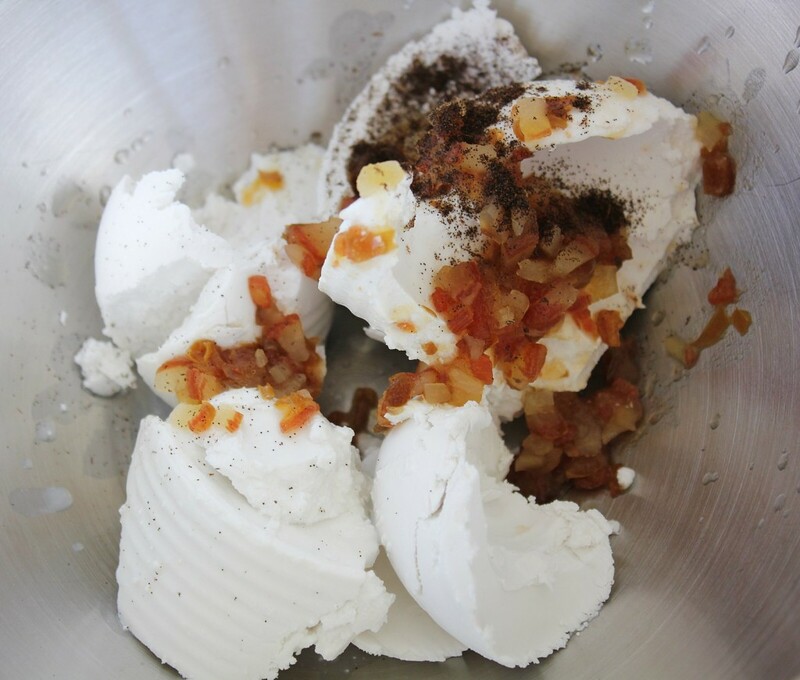 Using a stand mixer, hand mixer or a whisk and your bulging biceps, whisk the cream up with the soaked dates and vanilla until lighter and airy-er. 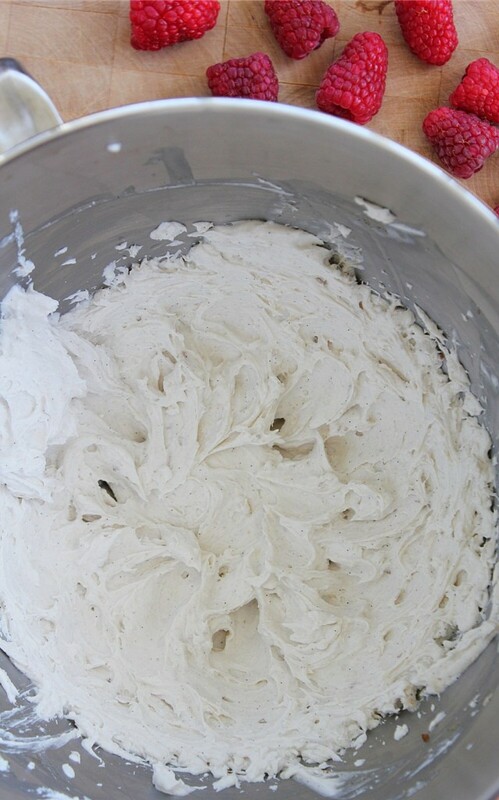 It won't get as voluminous as real whip cream, but it works very well for our purposes. 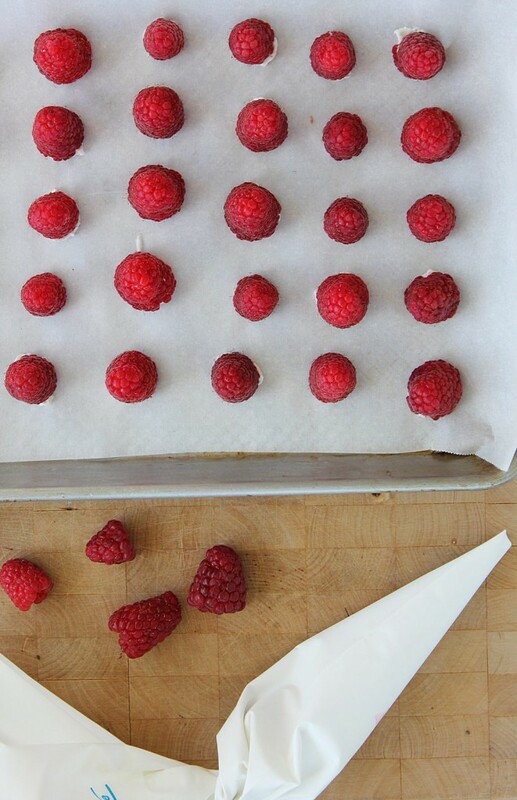 Gently wash your raspberries and lay them out on paper towels to dry. 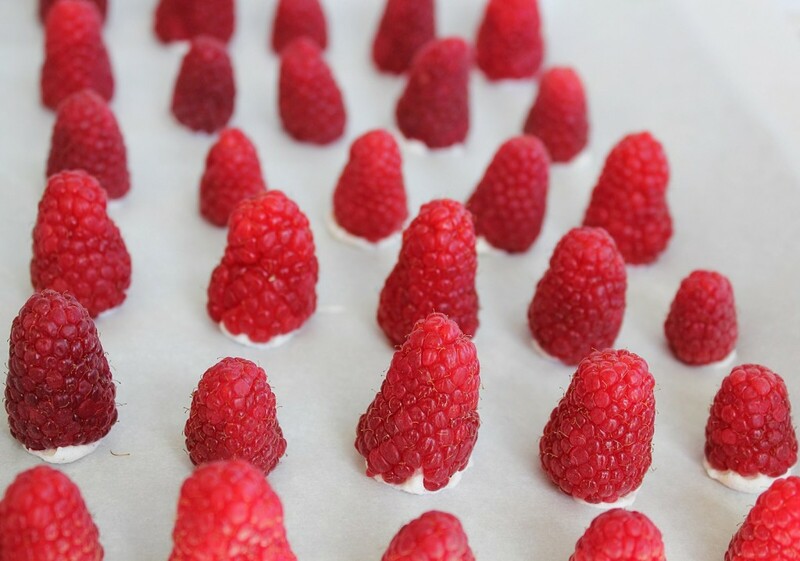 Using a piping bag (or a ziploc bag with the corner snipped out) quickly pipe the whip cream into the raspberries, lining the berries whip-side-down on a piece of parchment paper. The warmth from your hand will start to melt the cream so work quickly! 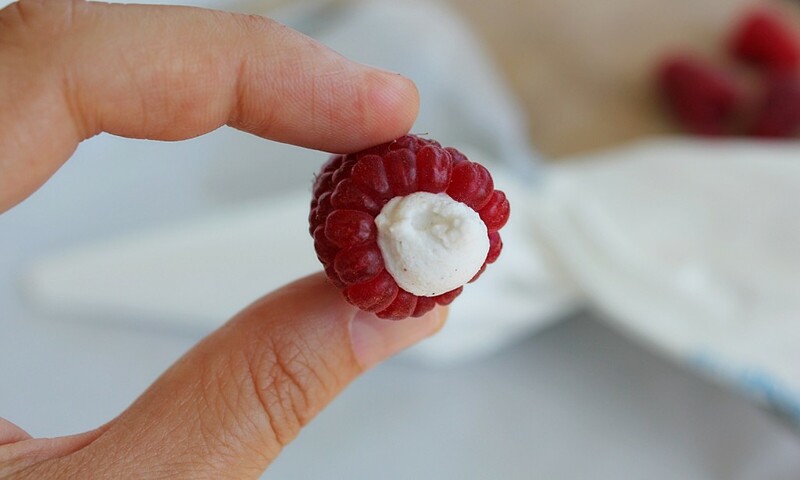 You may want to just eat them like this. Go for it, I don't blame you. 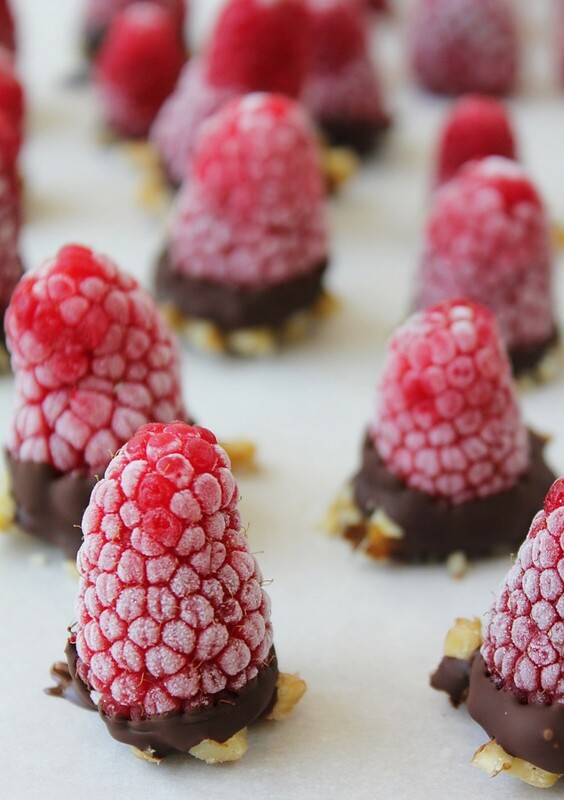 Pull the cream-stuffed raspberries out of the fridge (in small batches if your place is hot) and dip the open end in the chocolate, then the nuts and then place back on the parchment paper. Transfer them back to the freezer for a minimum of 20 minutes and then transfer to a freezer-safe container to store them in. Pull them out of the freezer a few minutes or so before you serve them for better flavour and a nice, semi-frozen texture.